When remodeling my kitchen I found this on overstock and was delighted. It’s definitely a showpiece in my kitchen. Found the same sink in the granite /quartz countertop store for double the price I paid. Elkay Quartz Luxe sinks are exceptionally tough and silky smooth to the touch. They come in striking colors that make a statement. These sinks are constructed through a proprietary manufacturing process that combines natural quartz with high-performance, UV-stable acrylic resins. 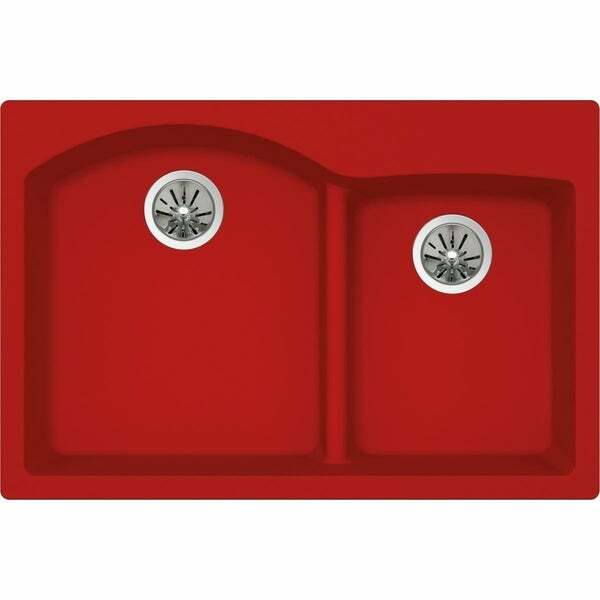 RICH COLOR HEAT SAFE EASY CLEAN: Match sink to your decor; vibrant color won't fade; heat safe to 535°F; wash with damp cloth and soapy water. MARASCHINO: Vibrant red makes every day a celebration. HYGIENE PROTECTION: Microfine quartz material is nonporous; ultrasmooth surface repels dirt food liquid and stains; prevents the spread of bacteria. Dimensions 25.0 In. X 36.0 In. X 13.0 In.